We feel very privileged to be part of your special day and our aim is to provide you with a personal service from the moment of booking the car to the actual wedding day, ensuring that every detail is considered to enable your wedding day to be as memorable and special as possible. We provide smart and courteous chauffeurs and as each car is only ever booked for one wedding per day, this allows us to dedicate the time you deserve to ensure every element of service is delivered. We respect that today some couples want a different format, so we arrive at where the bride is leaving from, and will let you know that the car is ready. We always arrive around 30 minutes before you need to leave to alleviate pressure. Our chauffeurs will wait by the car for the bride to come out whereupon the chauffeur will be happy to provide assistance on getting into the car if required. The person giving the bride away would normally travel in the bridal car too. 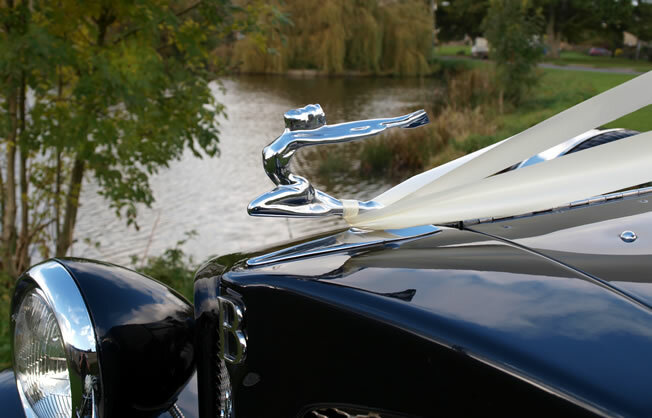 We will then transport you in style to your ceremony and the car will be parked outside waiting for you to come out. After the ceremony the wedding party usually gathers and has the opportunity for photographs. Once you are ready to go on to the reception our courteous chauffeurs will take the newly married couple to the reception venue. If where the bride is leaving from is close to the ceremony we will be more than happy to provide additional trips with the bridesmaids and the bride’s mother, at no extra cost, and by prior arrangement. Alternatively, you might wish to consider hiring a second car. We are happy to provide variations to our wedding car service. Please do not hesitate to contact us to discuss your individual requirements. Full back up facilities are also in place. We are a registered member of National Association of Wedding Car Professionals (NAWCP).